"this book can be seen as one of the best intertwinements of management theory and management practice" … "this remarkably helpful bible to practicing managers … is full of ideas, insights, analyses and even exhortations rooted in corporate and business realities, and is perhaps the best book of its type that I have read in my 34 year academic career"
(Professor Debi S. Saini). Stern Management Review, (December 2005): "If I were giving a graduate-level class in leadership and people management skills, I would use this book as the text"
…"if a client asked for a great book to enhance his/her leadership skills this would be one of the first books I would suggest. It’s that good! This book is an outstanding resource for leaders and aspiring leaders. It is filled with an abundance of insights: the distinction it makes between a leader and a manager is one of the best, if not the best, we’ve read"
… "it’s a powerful, broad-spectrum leadership toolkit with a wealth of information about skills and practices … it is clearly written and superbly organized. An excellent bibliography and subject index top off this outstanding work. We highly recommend this book"
(editors, Yvette Borcia and Gerry Stern). Business Information Alert (September 2005): "Maximum Performance is a comprehensive business tome. Although it is designed for students, busy executives who use the chapter summaries or chapter sections that focus in topics that interest them will find the book useful"
… the Australian content is refreshing, as is the lack of evangelistic promises of immediate transformation … this book is firmly grounded in supporting the learning and skill development needed for maximum performance" (Viv Read). 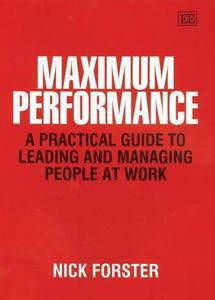 Maximum Performance is an essential read for all business owners, managers, consultants and key decision makers. It is an outstanding and comprehensive insight into the broad range of managerial and leadership issues which confront business people today. It is practical and littered with excellent case study examples and illustrations. Its unique style is easy to read, thought provoking and demystifies concepts that are easily misunderstood outside an MBA course. Grasp and digest this book quickly because it’s the smart thing to do.’ –Barry Smith, Managing Director, the General Management Consulting Group ‘Nick's book is an energetic and down-to-earth exploration of the many dimensions of this enigmatic thing we call leadership. It is a distillation of much knowledge, experience and insightful observation. There is refreshing and satisfying clarity of discussion; with comment on many management theories, explanations of evidence and research and the consequences of their applications in organisations.The pages are brimming with examples, keeping the messages real, practical and always interesting. Maximum Performance is thought provoking, and the reader is constantly challenged to assess his or her own knowledge, experience, attributes, perceptions and behaviour. ‘We all seem to know when we are receiving good or bad leadership, yet for many of us being a good leader seems to be so elusive. Why is this so? The fact that we are human and sometimes trapped by our wants, needs and motivations inevitably gets in the way, and leadership within Local Government is fraught with complex problems and competing forces both internally and externally. 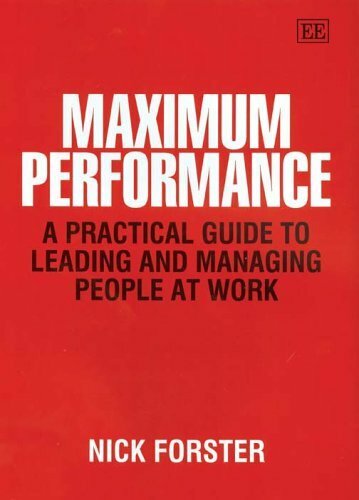 Maximum Performance will be an extremely useful aid for all who are looking for a practical, sensible and thought provoking insight into management and leadership issues. Nick provides an excellent insight into the mysteries of management and leadership with this very practical and useful book that I am sure will be a great resource for current and emerging leaders.’ –Ricky Burgess, CEO of the Western Australian Local Government Assocation and the Australian Institute of Management Business Woman of the Year, 1997.